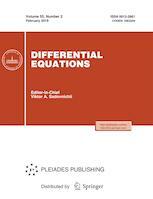 Differential Equations is a journal devoted to differential equations and the associated integral equations. The journal publishes original articles by authors from all countries and accepts manuscripts in English and Russian. The topics of the journal cover ordinary differential equations, partial differential equations, spectral theory of differential operators, integral and integral–differential equations, difference equations and their applications in control theory, mathematical modeling, shell theory, informatics, and oscillation theory. The journal is published in collaboration with the Department of Mathematics and the Division of Nanotechnologies and Information Technologies of the Russian Academy of Sciences and the Institute of Mathematics of the National Academy of Sciences of Belarus. Differential Equations is a peer reviewed journal. We use a single blind peer review format. Our team of reviewers includes over 70 reviewers, both internal and external (80%), from 5 countries. The average period from submission to first decision in 2017 was 60 days, and that from first decision to acceptance was 60 days. The rejection rate for submitted manuscripts in 2017 was 15%. The final decision on the acceptance of an article for publication is made by the Editorial Board. Any invited reviewer who feels unqualified or unable to review the manuscript due to the conflict of interests should promptly notify the editors and decline the invitation. Reviewers should formulate their statements clearly in a sound and reasoned way so that authors can use reviewer’s arguments to improve the manuscript. Personal criticism of the authors must be avoided. Reviewers should indicate in a review (i) any relevant published work that has not been cited by the authors, (ii) anything that has been reported in previous publications and not given appropriate reference or citation, (ii) any substantial similarity or overlap with any other manuscript (published or unpublished) of which they have personal knowledge.